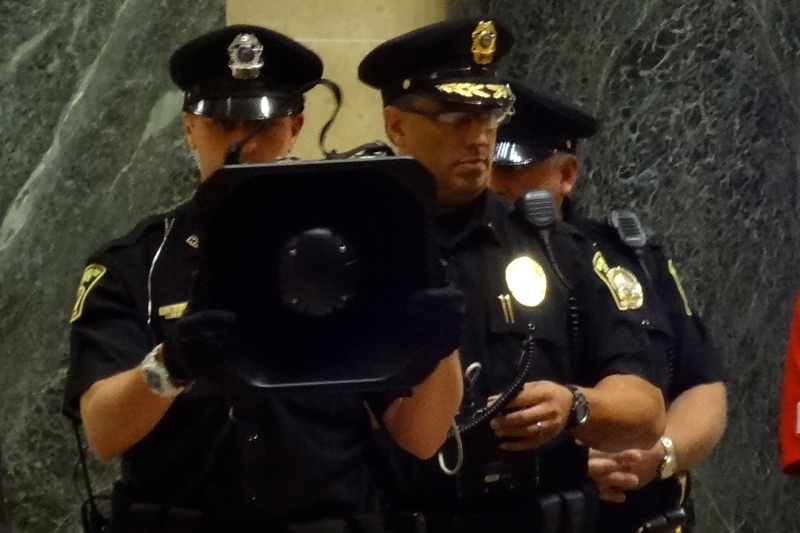 More people, including veterans and a teenager, were arrested for singing out their grievances to Wisconsin Governor Scott Walker and the Republican-dominated state legislature in the Capitol rotunda today. The crowd chanted “Hero! Hero!” and “Shero! 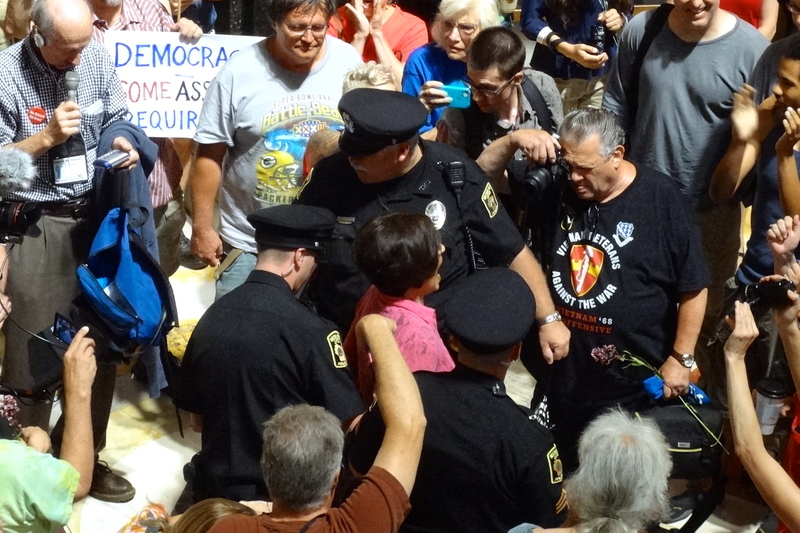 Shero!” as each person was picked off by groups of Capitol Police. Most continued singing during their arrests. 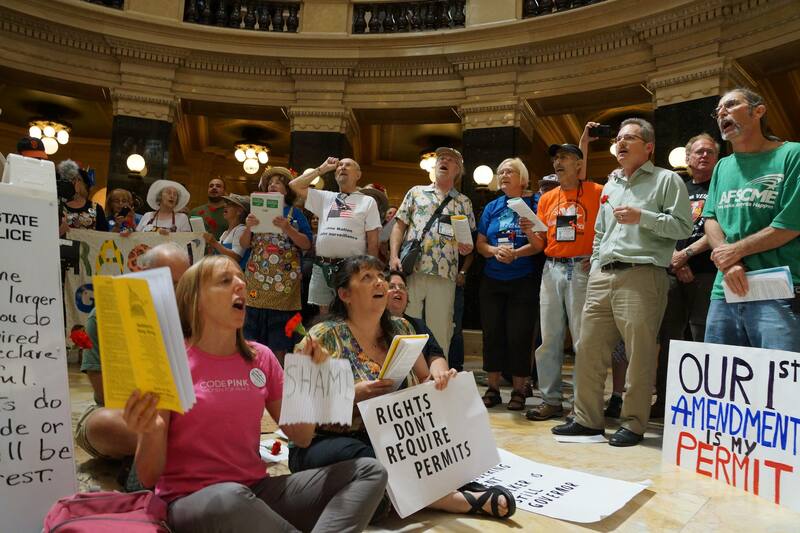 Local participants were joined by attendees of the Veterans for Peace National Convention and the Democracy Convention which are being held in downtown Madison this week. Medea Benjamin, co-founder of Code Pink: Women For Peace, an activist organization established to call for the end of the Iraq war sat in the center of the rotunda and sang for the entire hour, but was not issued a citation. Several out-of-town conventioneers were among those arrested. Because of their out-of-town status they were taken to jail instead of the basement of the Capitol for processing. Yesterday Capitol Police Information Officer Stephanie Marquis announced that the police would not be arresting spectators, despite the multiple warnings visitors and workers at the Capitol have been given over the past two weeks. Capitol Police Lieutenant Sloey confirmed that they would not be warning or arresting spectators today. Today’s arrests bring the total number of people arrested up to 104, and the number of citations up to 197, plus seven misdemeanors. The first people arrested on July 24 go to court for initial appearances tomorrow morning at 10. I called the Chief of Police and told him his department is a disgrace.